The four star Hotel Patio Andaluz is a national treasure that holds history within its walls. 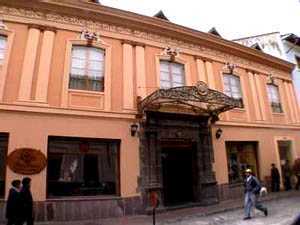 Situated in the heart of the historic Old City of Quito, which was declared the first cultural heritage of the world by UNESCO in 1978, the hotel is surrounded by churches, museums, and national monuments. It is a marvelous colonial building dating back to the foundation of Quito, and has been beautifully and meticulously restored. Enjoy the enchantment of this elegant, 31-room boutique hotel, with wide corridors, expansive stairways, large arches, balconies, and towering atrium-style patios, which lend to the feeling of a long-ago Quito. One of the first things you will notice when you enter is the sense of tranquility and calm, after the bustle of the city outside. Hotel amenities include a coffee shop, full gourmet restaurant, a Tapas wine bar, spa with massage therapist and aromatherapy, gym and solarium. The spacious rooms are luxuriously appointed with colonial style furnishings, but are complete with all of the comforts of a deluxe hotel: hair dryers, minibar, safety boxes, central air-conditioning/heat, and full tub bathrooms.